Chickenings suggested this item when it was a BBC story, and it took me this long to find a larger version of the shot than the usual BBC postage stamp. Brits may already be familiar with the porkers in question. Apparently this is a commercial shot, but it turns out that we're looking at "full-size" miniature pigs, not piglets. It turns out that Pennywell Farm in Devon bred smaller and smaller pigs for nine years, until they settled on this pint-sized version. Mr Murray doubts if they will be appearing on restaurant menus. "They are too small," he said. "It would be uneconomic so it's unlikely they will be used for meat and there is already a huge amount of different pig meat available." Well, that's for us to decide, Mr Murray. A new alternative to lap dogs? At least they wouldn't shed. Now those are cute. And I don't *do* cute. Recall the giant (1,000 lb) Hog a while back... and the giant pumpkins? Now we know where McDonalds gets their McRib sandwiches..
Wasn't that a dainty dish to put before a king? 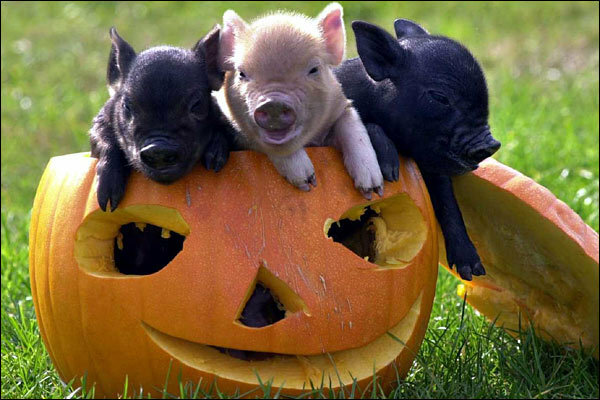 If we put these lil' piggies in this pumpkin, then we could have piggie-punkin-flambe served al fresco!! Just seeing the title in New Posts I gave a little "Oh!" of happiness. Oh the lovely lovely little piggies! I want one for the house, so my cats can ride it up and down the stairs and then we can make it into little chipolatas when it's done. Looks like they let the piggies carve that punkin before they climbed in, too. Definately not a contest winner. There is no smoking on this flight, but you can light up whatever you like once we land in Jamaica. Just the laugh I needed ! !